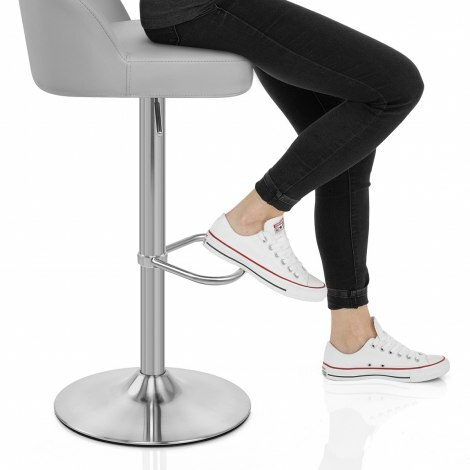 Stylish, sophisticated and superbly supportive, the Mimi Brushed Steel Stool Grey will not disappoint. Upgrading your interior with its cool finishes and luxury style, the Mimi Brushed Steel Stool is a wonder of an item with timeless modern appeal. Covered in stunning grey faux leather, it provides a fabulous feature in any room. Ergonomic features like the mid-height backrest ensure that the lower back is adequately supported, while high-density foam padding keeps you comfortable. The one-column frame incorporates a simple gas-lift mechanism, 360-degree swivel movement, and a handcrafted footrest. The Mimi has a classic rounded base, with a protective underside to help to prevent damage to your floors. "Superb quality and excellent service throughout"
Fantastic stools, excellent quality and were delivered on time. Thank you for an excellent service, the delivery time was spot on the quality is excellent and all for a reasonable price. Thank you. Really pleased with our bar stools. Easy to assemble and look great in the kitchen. Wipe clean material so ideal. After several weeks searching I stumbled across Atlantic website within minutes I knew I had found exactly what I was looking for I immediately ordered 4 stools they arrived 24 hours later within a hour time slot given, they matched perfectly with my new kitchen I was more than pleased unfortunately my kitchen was only half built at the time after erecting just 2 I anticipated I would only need 2 so arranged a return delivery which was dealt with by a simple phone call with precise instructions how to label and return, they were collected the day after by courier I was advised my money could take up to 10 days to refund to my bank account however the money was back in my account just 2 days after collection. Now after completion of kitchen I now find I could have easily kept the 2 I returned so I’ll be ordering again, everyone who has visited have commented how nice they are and I have recommended Atlantic to family and friends the products are beautiful and customer service is excellent! I don’t think I’ve ever experienced such a good service before I just want to say many many thanks.